CURRENTLY PLANNING 2019 - STAY TUNED FOR FUTURE EVENTS! VIP CATERED PRIVATE PARTY & FRIST LOOK WITH PRO NINJAS! 7-9 PM @ BUDWEISER EVENTS CENTER. VIP & ULTIMATE PASSES ONLY! SUPERVISED OPEN PLAY – 8 AM – 10 AM! Come hang with the Ninjas and play on the amazing obstacles! Ultimate Passes welcome without ticket to any and all Open Play time slots! KID’S CLASSES with the top Ninjas start at 10AM and go until 7PM. Each class lasts approximately 1 hour hands-on and includes Ninja’s signatures and photos with your kids! Tickets for Kid’s classes are bundled with a Spectator Ticket (a $30 value.) Ages 4 & up and adults welcome! 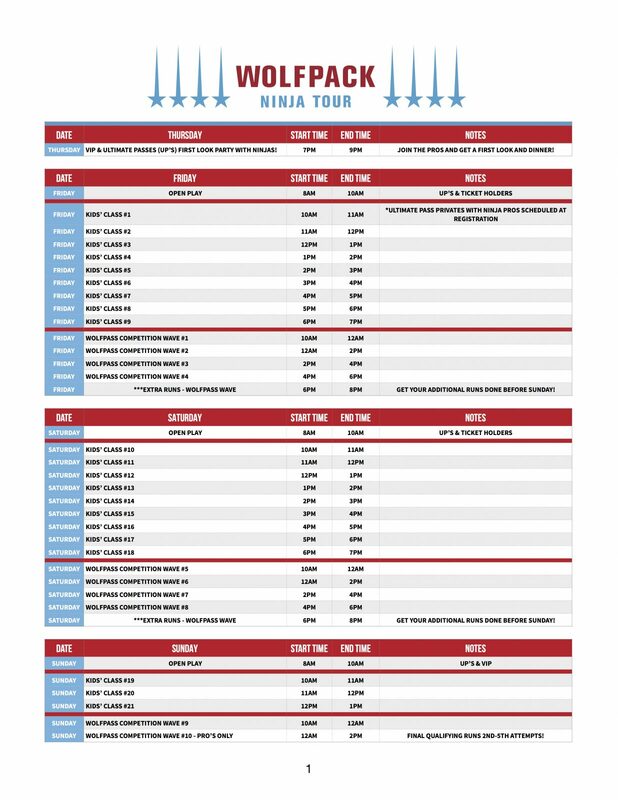 There will be Ninja exhibitions and demos on the Pro Course throughout the day as well as music and a Health Fair/Vendor Fair. ULTIMATE PASS & VIP ONLY: SUPERVISED OPEN PLAY – 8AM – 10AM! Come hang with the Ninjas and play on the amazing obstacles! Kid’s classes with the top Ninjas start at 10AMand go until 12PM. Each class lasts approximately 1 hour and includes Ninja’s signatures and photos with your kids! Competitor Waves also start at 10AM and last 2 hours each. Waves will go until 2PM when all event participants are asked to leave for the set-up of the FINALS EVENT. 2:30PM will be YOUTH Male & Female division finals as well as AMATEUR Male & Female division. FREE TO SPECTATE for the public! The FINALS will begin at 5PM for the Pros Female/Male Divisions. General Admission seating begins at 4:30PM.